Pine Island is heading into its ninth straight season in which a UVA nursing student will serve as Medic, and we could not be happier about it. Lauren Brill will be the fifth in an unbroken string of stellar UVA nursing students to serve as Medic at Pine Island in the last decade. This win-win relationship started with an email director Ben Swan received during the winter of 2010 from Page Dunbar, a third-year nursing student in Charlottesville. “I almost never even respond to random inquiries over the Internet, but there was something about Page Dunbar’s that made me want to find out more,” said Ben in a recent interview. Ben met with Page in Charlottesville that winter and Page, who had already received her EMT certification, arrived in June to head up the PIC infirmary. Page had never been to Maine, and during a dinner with Ben and Sumner this fall in Charlottesville, where Page is now a nurse practitioner, she revealed that she was extremely nervous about what she had gotten herself into and that she really didn’t know much about living conditions on the island when she applied. “Ben let me go to the Swans’ house in Brunswick to take a hot shower during staff week. I think he could see that I was in a state of mild shock.” The shower did the trick; Page quickly grew to love PIC and PIC loved her. Page regrets not returning for another summer after graduation, but she enthusiastically recruited our next Medic from the class behind her at UVA. Caroline Moughan joined us in 2011 and had such a great time (in spite of a spectacularly virulent barf bug) that she figured out she could return after graduation and take her boards on one of her days off! Mary Harrington, originally a native of Brunswick, ME, was next up and, starting after her second year at UVA managed to be our Medic for three summers. It was Mary who worked hard to introduce Ben Swan to UVA Nursing dean, Theresa Carroll, and they finally met in person in the fall of 2016. Theresa is a real Pine Islander and is all in on helping connect UVA nursing students with Pine Island. Mary Harrington, who also passed her boards on a day off from PIC, is now a pediatric ICU nurse in Boise, ID and was very helpful in finding her replacement, Natalie Miner. Natalie was with us for two summers and again proved that we couldn’t wish for a more competent, energetic, caring Medic than one from the ranks of UVA Nursing. 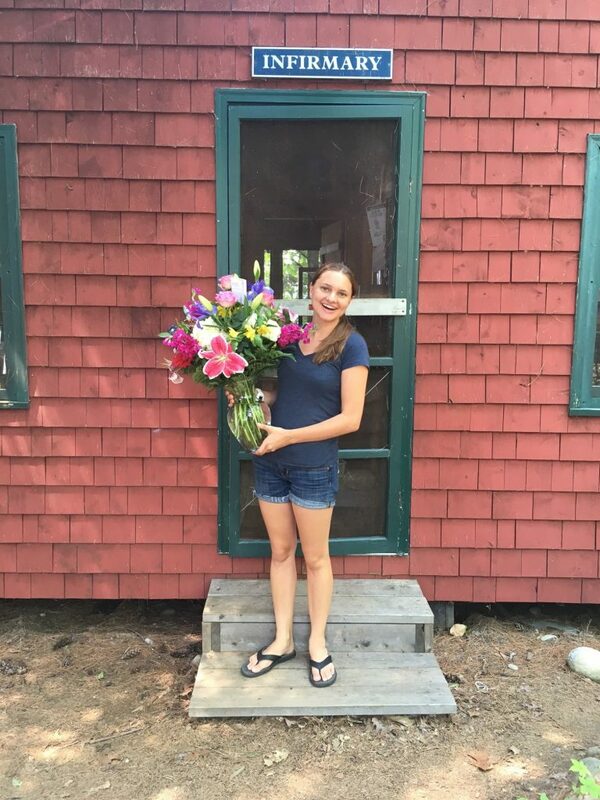 She is pictured here with the bouquet she received from her father the day she passed her boards last summer. Ben Swan and assistant director Sumner Ford were in Charlottesville this fall and met with two candidates recruited by Theresa Carroll and Natalie Miner. They are looking forward to welcoming Lauren Brill to PIC in June and to many more summers of superior care for the Pine Island community from our UVA medics. This entry was posted in Pine Island Staff, The Pine Needle on March 2, 2018 by Pine Island Camp.